Every year, trillions of animals migrate for thousands of kilometres between their summer and winter habitats. Among them are several species of bats whose journeys in the dark of the night unfold largely unnoticed by humans and have only partially been investigated by science. A reconstruction of individual migration patterns of the common noctule (Nyctalus noctula) in Central Europe has now revealed that traveling distances vary greatly among individuals, yet overall, females cover longer distances than males. 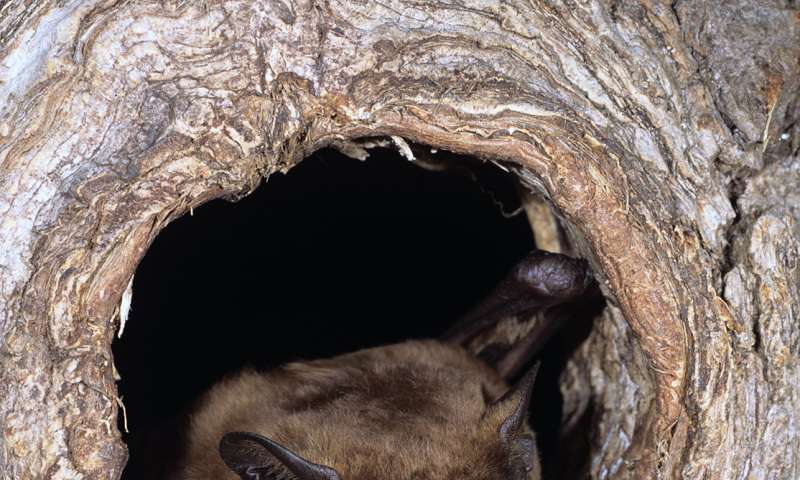 Local bat populations, which remain separate when females rear their offspring in summer, strongly mix in their hibernacula, the roost where they hibernate in winter. Additionally, the study showed that individuals rarely change their migration habits—a behaviour that could prove problematic when bats are forced to adjust to rapidly changing ecosystems. The study was published in the Proceedings of the Royal Society B: Biological Sciences. An international team of scientists led by the Leibniz Institute for Zoo and Wildlife Research (Leibniz-IZW) in Berlin used stable hydrogen isotope ratios in minute fur samples to estimate the region of origin of more than 1,000 individuals from seven wintering areas across Central Europe. This data informed researchers about the migration routes of noctule bats within, into and out of Central Europe. The data reveals that the animals from a hibernacula show a great variety of migratory behaviour: The majority of the bats populate the same region in summer and winter, but in each hibernacula, a significant share of animals traveled for longer distances to reach it. "We showed that individuals from a hibernacula can show divergent migratory behaviours with some individuals staying local and others being long-distance migrants," says Christian Voigt from the Leibniz-IZW. "This pattern is called partial migration, and it causes strong genetic mixing of populations when bats mate during migration and hibernation. During rearing of the offspring in the summer months, bats remain separate in distinct regions such as Poland, Russia, the Baltic States, Scandinavia or Germany." Furthermore, data analyses indicate that female bats cover especially long distances in their migration. More often than males, female common noctules came from northern regions to their hibernacula. Correlating these findings with morphologic measurements, the researchers show that the females benefit from long journeys. "We derived a coefficient from body mass and forearm length, a body mass index, and were able to show that males are in best shape when they stay in the same region locally, while among females, the ones who travel long distances are in better shape," explains Linn Lehnert from Leibniz-IZW, first author of the study. "We assume that a superior food supply for the insectivorous bats in northern regions is the main reason for this pattern. Females have higher energy demands during pregnancy and nursing, which makes it worthwhile for them to shoulder the epic journeys." Males, on the contrary, migrate predominantly during their early life and tend to adopt a regional lifestyle for much of their adult life. Last but not least, the scientists analysed isotopic data from 79 individuals that were caught more than once in different years in the same hibernacula. They found that the vast majority of common noctules are creatures of habit. Eighty-six percent showed the exact same migratory behaviour as in a previous year. These firm habits could constrain adjusting to changing environmental conditions, a scenario that becomes more and more probable thinking of global warming, insect decline and other human-induced ecosystem changes. Individuals with a greater flexibility may have better chances to cope successfully with these challenges. In order to assess the resilience of different bat species in connection with migratory behaviour, more research is needed, says Lehnert. "What we do know for sure, however, is how important local hibernacula are for the population of the common noctule bat in Central Europe. A combination of locally embedded and internationally coordinated conservation efforts is needed urgently to protect hibernacula."